SRA Home Products’ sunroom additions are stronger and more durable than many comparable products on the market, offering Toms River, New Jersey, homeowners the peace of mind that comes with knowing they’ve invested in a quality product that will last for years to come. 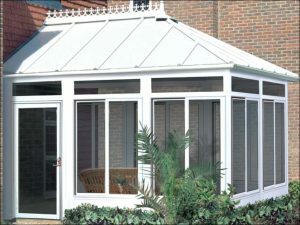 We are proud to exclusively install sunrooms manufactured by industry leader TEMO. Like the rest of their outdoor living products, TEMO constructs their sunrooms using heavy-duty, fully extruded aluminum. This sturdy material offers unbeatable strength — it’s stronger than wood, vinyl, and roll-formed aluminum, allowing our sunrooms to withstand high winds of up to 110 miles per hour. Our sunroom additions also provide Toms River, NJ, homeowners with exceptional durability, enabling them to last through season after season. The heavy-duty, fully extruded aluminum that provides our sunrooms with unsurpassed strength also resists deterioration, rotting, and insect infestation. Additionally, our sunrooms are coated with TEMO’s exclusive TEMKOR cladding, which protects against warping, denting, cracking, peeling, scratching, fading, and chalking. We also install sunroom additions from TEMO’s Nino Vitale Signature Collection, which offers customers the opportunity to further customize their new sunroom by selecting among various roofing styles, knee wall options, and more. If you’re in the Toms River, NJ, area and would like to learn more about TEMO’s outstanding line of sunroom additions, please contact SRA Home Products today. We’ve been serving the Delaware Valley region since 1988 — we’ve completed more than 5,500 projects since that time — and our commitment to providing our customers with unmatched craftsmanship and service has helped us to achieve an A+ rating with the Better Business Bureau.